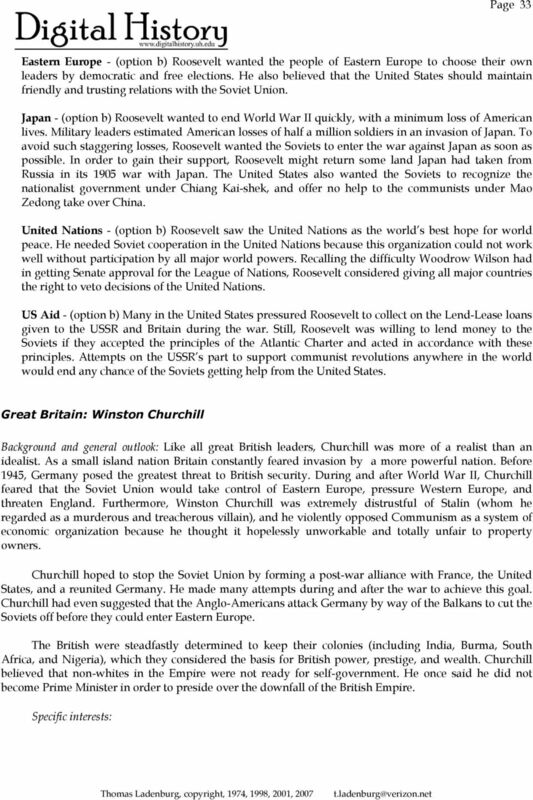 Download "Chapter 6 The Yalta Conference"
1 Page 29 Chapter 6 The Yalta Conference While Germany and the Allies were engaged in the Battle of the Bulge, US President Franklin Roosevelt and British Prime Minister Winston Churchill prepared to meet with Marshall Joseph Stalin of the USSR. The three leaders were scheduled to confer on Soviet territory at the Black Sea resort town of Yalta in early February The Big Three, as they were called, had previously met in Teheran, Iran, where they had discussed plans to defeat the Axis. Stalin, still concerned that the brunt of Germany s forces were directed at Russia, inquired again as to when the Western allies would divert Hitler s attention from the eastern front by opening up a second front in France. This time, with Germany at the verge of defeat, the leaders of the Grand Alliance met to determine the nature of the post-axis peace. They would redraw the world map and decide the boundary lines of countries in Europe and Asia. Specifically, they would reach crucial decisions on Germany, Poland, Eastern Europe, Japan, and on the formation of the United Nations. 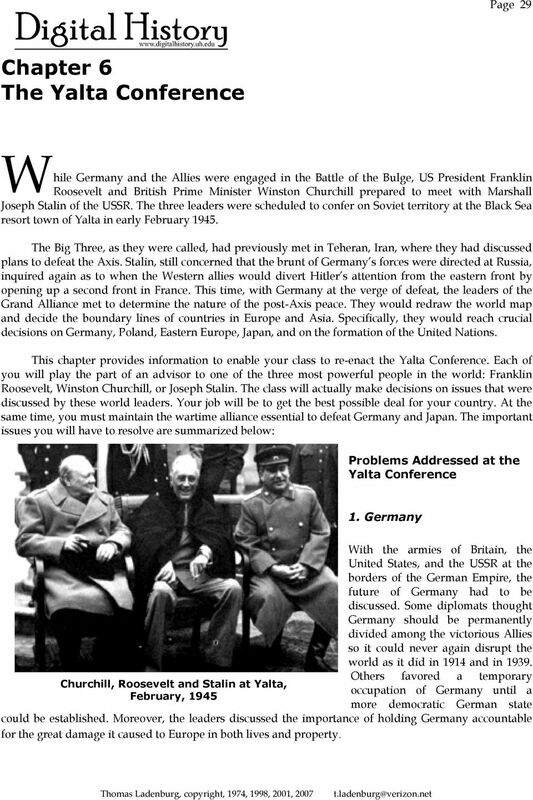 This chapter provides information to enable your class to re-enact the Yalta Conference. Each of you will play the part of an advisor to one of the three most powerful people in the world: Franklin Roosevelt, Winston Churchill, or Joseph Stalin. The class will actually make decisions on issues that were discussed by these world leaders. Your job will be to get the best possible deal for your country. At the same time, you must maintain the wartime alliance essential to defeat Germany and Japan. The important issues you will have to resolve are summarized below: Problems Addressed at the Yalta Conference 1. Germany Churchill, Roosevelt and Stalin at Yalta, February, 1945 With the armies of Britain, the United States, and the USSR at the borders of the German Empire, the future of Germany had to be discussed. Some diplomats thought Germany should be permanently divided among the victorious Allies so it could never again disrupt the world as it did in 1914 and in Others favored a temporary occupation of Germany until a more democratic German state could be established. Moreover, the leaders discussed the importance of holding Germany accountable for the great damage it caused to Europe in both lives and property. 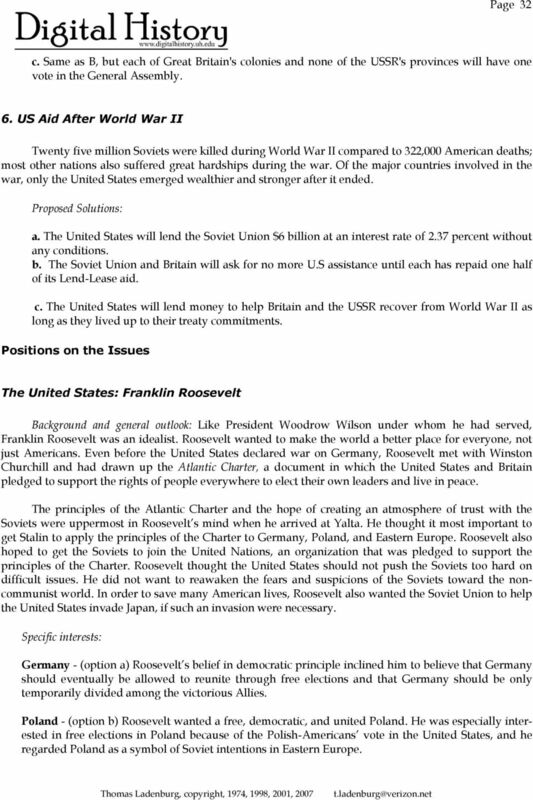 2 Page 30 Possible solutions: a. Divide Germany permanently among the Allies and make it pay $20 billion ($340 billion 2000 dollars) for damages done during the war; 80 percent of which would go to the USSR. b. Temporarily divide Germany into three occupation zones, one for each of the Allies. Allow these zones to be reunited through democratic elections. Allow reparations not to exceed $10 billion (170 billion in year 2000 dollars). c. Same as b but give France part of the British and American zones and adjust reparations to Germany s ability to pay. 2. Poland Poland had two governments. The communist government friendly with the USSR was known as the Lublin Poles. The other government, which had gone into exile in Britain after the German conquest in 1939, was called the London Poles. Members of both governments considered themselves Poland's lawful rulers. The Soviet Union also wanted territory in East Poland to act as a buffer against future invasions by Germany. Possible solutions: a. Let the Lublin Poles organize the Polish government and give the Soviet Union eastern Poland. In order to make up for its loss to the USSR, give Poland the most eastern parts of Germany. b. Let the residents of eastern Poland decide by free elections whether to submit to Polish or Soviet rule; let those in eastern Germany decide whether to submit to Polish or German rule. c. Hold free elections in Poland under the supervision of American, British, and Soviet observers. Allow all groups to vote. Do not cede any part of Poland to the Soviet Union, and do not give any part of Germany to Poland. 3. Self-Government and Eastern Europe The leaders who convened at Yalta essentially held the fate of Eastern Europe in their own hands. They had to decide who would form governments in the Eastern European countries that had recently been freed of German control by the Soviet Union; their resolutions would have immense repercussions for the countries themselves and, more importantly, Europe and the rest of the world. Of lesser importance for Europe but still on the agenda for the Soviet Union was the matter of colonial government, particularly in India. Possible solutions: a. Let the USSR form the governments in Bulgaria, Romania, Hungary, etc. Allow these governments to take land from the rich and give it to poor farmers, stop exploitation of workers by wealthy businessmen, and maintain friendly relations with the Soviet Union. 3 Page 31 b. Let the people in each liberated area in Europe, Asia and Africa determine how and by whom they will be governed. This means free elections to determine each nation's future including the West's colonies and Eastern Europe but not in the southern parts of the US c. Hold free elections in all Eastern European countries, but not in India or any other colonies belonging to the US, Great Britain, or France. 4. Japan and the Far East The issue here was whether the Soviet Union would help the United States in its war against Japan and what the Soviets would want in return for that assistance. US and British leaders also feared that Stalin would shift his support from Chiang Kai-shek's nationalist government of China to Mao Zedong's communist revolutionaries. Possible solutions: a. The Soviet Union will join the war against Japan when it is in her interest..the USSR will be allowed to occupy Manchuria, Korea, Port Arthur, the Sakhalin Peninsula and the Kurile Islands, and will recognize the Communist party under Mao Zedong as the rightful ruler of China. b. The Soviet Union will declare war against Japan within three months of Germany s surrender and announce its support for the Nationalist leader Chiang Kai-shek. In exchange, the USSR will be granted one-half of the Sakhalin Peninsula, military access to Port Arthur, and partial control of railroads in the Chinese province of Manchuria. c. The Soviet Union will go to war against Japan immediately, not ask for any territory, and announce its support of Chiang Kai-shek in his civil war against communist forces under Mao Zedung. 5. The United Nations The world powers also debated over whether a world organization similar to the League of Nations that had been borne out of the Treaty of Versailles should be formed to settle disputes between countries peacefully and, if so, whether the USSR would participate and how many votes it would get. Possible solutions: a. The USSR will participate in the United Nations, but with one vote for each of its 15 socialist republics (provinces) in the General Assembly. The United States and Britain will have one vote in the United Nations. 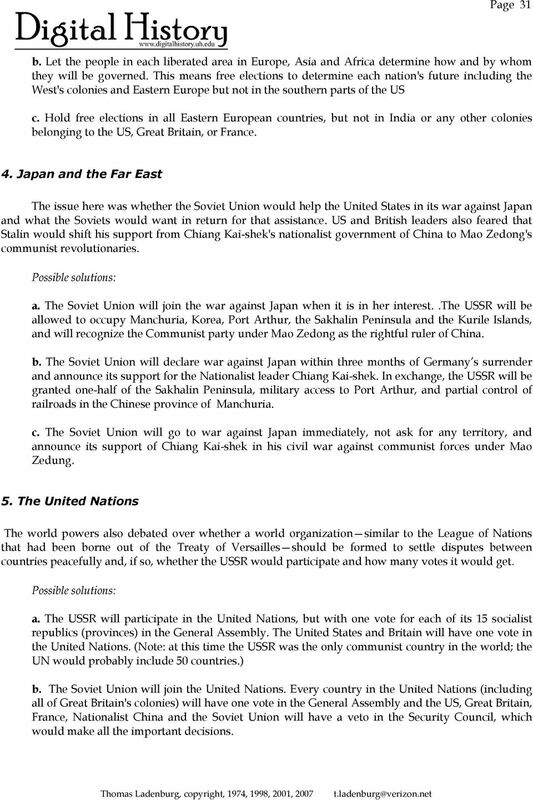 (Note: at this time the USSR was the only communist country in the world; the UN would probably include 50 countries.) b. The Soviet Union will join the United Nations. Every country in the United Nations (including all of Great Britain's colonies) will have one vote in the General Assembly and the US, Great Britain, France, Nationalist China and the Soviet Union will have a veto in the Security Council, which would make all the important decisions. 4 Page 32 c. Same as B, but each of Great Britain's colonies and none of the USSR's provinces will have one vote in the General Assembly. 6. US Aid After World War II Twenty five million Soviets were killed during World War II compared to 322,000 American deaths; most other nations also suffered great hardships during the war. Of the major countries involved in the war, only the United States emerged wealthier and stronger after it ended. Proposed Solutions: a. The United States will lend the Soviet Union $6 billion at an interest rate of 2.37 percent without any conditions. b. The Soviet Union and Britain will ask for no more U.S assistance until each has repaid one half of its Lend-Lease aid. c. The United States will lend money to help Britain and the USSR recover from World War II as long as they lived up to their treaty commitments. Positions on the Issues The United States: Franklin Roosevelt Background and general outlook: Like President Woodrow Wilson under whom he had served, Franklin Roosevelt was an idealist. Roosevelt wanted to make the world a better place for everyone, not just Americans. Even before the United States declared war on Germany, Roosevelt met with Winston Churchill and had drawn up the Atlantic Charter, a document in which the United States and Britain pledged to support the rights of people everywhere to elect their own leaders and live in peace. The principles of the Atlantic Charter and the hope of creating an atmosphere of trust with the Soviets were uppermost in Roosevelt s mind when he arrived at Yalta. He thought it most important to get Stalin to apply the principles of the Charter to Germany, Poland, and Eastern Europe. Roosevelt also hoped to get the Soviets to join the United Nations, an organization that was pledged to support the principles of the Charter. Roosevelt thought the United States should not push the Soviets too hard on difficult issues. He did not want to reawaken the fears and suspicions of the Soviets toward the noncommunist world. In order to save many American lives, Roosevelt also wanted the Soviet Union to help the United States invade Japan, if such an invasion were necessary. Specific interests: Germany - (option a) Roosevelt s belief in democratic principle inclined him to believe that Germany should eventually be allowed to reunite through free elections and that Germany should be only temporarily divided among the victorious Allies. Poland - (option b) Roosevelt wanted a free, democratic, and united Poland. He was especially interested in free elections in Poland because of the Polish-Americans vote in the United States, and he regarded Poland as a symbol of Soviet intentions in Eastern Europe. 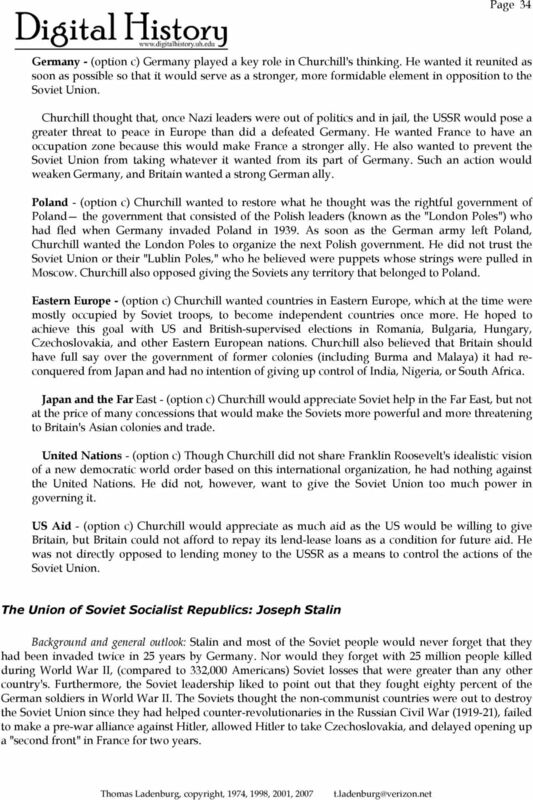 6 Page 34 Germany - (option c) Germany played a key role in Churchill's thinking. He wanted it reunited as soon as possible so that it would serve as a stronger, more formidable element in opposition to the Soviet Union. Churchill thought that, once Nazi leaders were out of politics and in jail, the USSR would pose a greater threat to peace in Europe than did a defeated Germany. He wanted France to have an occupation zone because this would make France a stronger ally. He also wanted to prevent the Soviet Union from taking whatever it wanted from its part of Germany. Such an action would weaken Germany, and Britain wanted a strong German ally. Poland - (option c) Churchill wanted to restore what he thought was the rightful government of Poland the government that consisted of the Polish leaders (known as the "London Poles") who had fled when Germany invaded Poland in As soon as the German army left Poland, Churchill wanted the London Poles to organize the next Polish government. He did not trust the Soviet Union or their "Lublin Poles," who he believed were puppets whose strings were pulled in Moscow. Churchill also opposed giving the Soviets any territory that belonged to Poland. Eastern Europe - (option c) Churchill wanted countries in Eastern Europe, which at the time were mostly occupied by Soviet troops, to become independent countries once more. He hoped to achieve this goal with US and British-supervised elections in Romania, Bulgaria, Hungary, Czechoslovakia, and other Eastern European nations. Churchill also believed that Britain should have full say over the government of former colonies (including Burma and Malaya) it had reconquered from Japan and had no intention of giving up control of India, Nigeria, or South Africa. Japan and the Far East - (option c) Churchill would appreciate Soviet help in the Far East, but not at the price of many concessions that would make the Soviets more powerful and more threatening to Britain's Asian colonies and trade. United Nations - (option c) Though Churchill did not share Franklin Roosevelt's idealistic vision of a new democratic world order based on this international organization, he had nothing against the United Nations. He did not, however, want to give the Soviet Union too much power in governing it. US Aid - (option c) Churchill would appreciate as much aid as the US would be willing to give Britain, but Britain could not afford to repay its lend-lease loans as a condition for future aid. He was not directly opposed to lending money to the USSR as a means to control the actions of the Soviet Union. The Union of Soviet Socialist Republics: Joseph Stalin Background and general outlook: Stalin and most of the Soviet people would never forget that they had been invaded twice in 25 years by Germany. Nor would they forget with 25 million people killed during World War II, (compared to 332,000 Americans) Soviet losses that were greater than any other country's. Furthermore, the Soviet leadership liked to point out that they fought eighty percent of the German soldiers in World War II. The Soviets thought the non-communist countries were out to destroy the Soviet Union since they had helped counter-revolutionaries in the Russian Civil War ( ), failed to make a pre-war alliance against Hitler, allowed Hitler to take Czechoslovakia, and delayed opening up a "second front" in France for two years. 7 Page 35 Soviet negotiators also believed in their system of government. They thought what they called "socialism" was a much fairer way to share and produce wealth than the free enterprise system practiced in Great Britain and the United States. The Soviets claimed that under the system they called capitalism property owners get rich by taking advantage of workers. Soviet communists believed it was only a matter of time before the workers would overthrow all capitalist governments. Specific interests: Germany - (option a) Stalin was determined that Germany be permanently divided under the supervision of Britain, the USSR, and the United States. Furthermore, the Soviets wanted to take $20 billion (340 billion 2000 dollars) from what was left of Germany to repay the Soviets for a part of their losses during World War II. Poland - (option a) Stalin called for a friendly, socialist government installed in Poland under the leadership of the Lublin Poles. He opposed a role in Poland s future for the London Poles, whom he regarded as puppets of Winston Churchill. Stalin also wanted parts of eastern Poland added to the USSR to provide a buffer area to absorb a possible attack from Germany in the future. Eastern Europe - (option a) Stalin believed that, since the Soviet Union had driven the German Army out of Eastern Europe, it should be allowed to decide how the countries in this region would be governed. These countries would also serve as buffer states to protect the USSR from future attacks. He noticed that the United States and Britain had established a government in Italy without consulting the Soviet Union. Stalin thought Roosevelt and Churchill were hypocritical to insist on free elections in Eastern Europe when Britain did not grant free elections in its colonies and the United States denied the vote to Southern blacks. Japan and the Far East - (option a) Stalin wanted to regain land taken from Russia by Japan in 1905: the Kurile Islands, the South Sakhalin Peninsula, and Port Arthur. In addition, Stalin wanted control of the railroads in Manchuria and an occupation zone in Japan. He also considered giving support to communist leader Mao Zedung as the rightful ruler of China. If the United States wanted the USSR to help invade Japan after the losses the USSR suffered against Germany, Stalin thought he could bargain for most or all of the above. United Nations - (option a) Stalin suspected that the United Nations would be used as an instrument to embarrass or attack the Soviet Union, but he was willing to join the United Nations if the Soviets were given 15 votes in the General Assembly (one for every Soviet republic) and/or veto power in the Security Council. US Aid - (a) The USSR desperately needed money to rebuild an economy devastated by four terrible years of warfare. Stalin was willing to accept help from the United States as long as there were no strings attached. 8 Page 36 Suggested Student Exercises: 1. Identify or define and briefly tell the importance to the rest of this chapter of each of the following: a. Big Three b. Yalta c. Position of troops at time of conference d. London and Lublin Poles e. Security Council and General Assembly f. Six problems 2. Make as strong an argument as you can to support your country s position on at least four of the issues discussed in the chapter. 3. As your teacher directs, sit with the other students representing your country. Talk with your group to be sure you all understand each issue and can argue for your country s position. Then elect a leader who will send several (up to three) students to each of the other two countries. The job of each diplomat is to get an idea of the concessions the other countries are willing to make. Be sure to argue for and explain the logic and fairness of your country s proposals. Then return to your group and report to your leader. 4. The leaders, with one advisor, will come to the center of the classroom to complete negotiations. 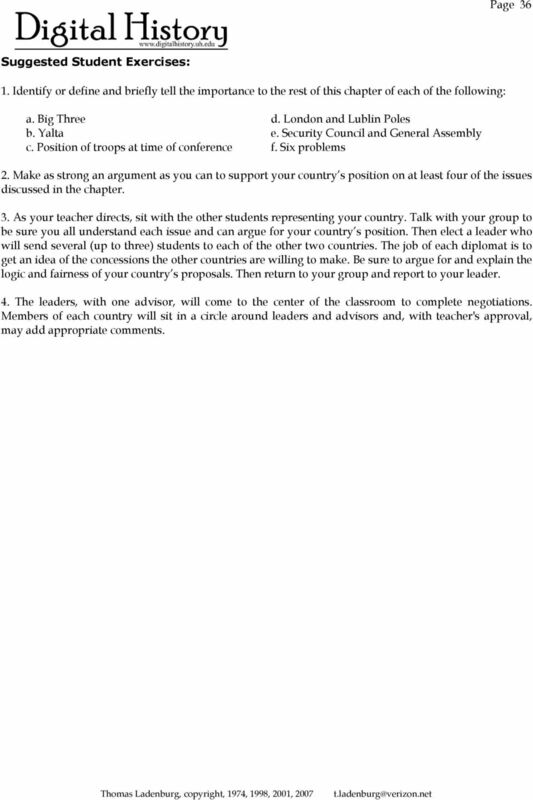 Members of each country will sit in a circle around leaders and advisors and, with teacher's approval, may add appropriate comments. 9 Page 37 Epilogue: Results of the Yalta Conference Germany was temporarily divided into four occupation zones, with the French zone carved out of those of the United States and British zones. Berlin, in the eastern (Soviet) zone, was also divided temporarily among the same four nations. Austria and its capital city, Vienna, were similarly divided. Poland was to be administered by a coalition government, which would then hold free elections under Allied supervision. In addition, much of eastern Poland was given to the Soviet Union; Poland in turn was given eastern portions of Germany. The USSR pledged to hold free elections in the Eastern European countries that had been liberated by the Red Army: Romania, Bulgaria, Czechoslovakia, and Hungary. The Soviet Union promised to enter the war against Japan within three months of Hitler s defeat and it recognized Chiang Kai-shek as the legitimate ruler of China. In exchange, the Soviets received the southern Sakhalin Peninsula, the Kurile Islands, and Port Arthur. The Soviets joined the United Nations; they were given three votes in the General Assembly and (along with the United States, Britain, nationalist China, and France) veto power in the Security Council. No decision was reached about postwar loans. Opinions on the Yalta Conference With the advantage of hindsight, many Americans charged President Roosevelt with negotiating an agreement with the Soviet Union which, like the Munich Accord, surrendered territory in exchange for empty promises. Roosevelt Democrats defended themselves by pointing to numerous Soviet concessions. Many historians of the period have argued that the Yalta Agreement was the best pact the United States and Britain could have hoped for, given the situation at the time. 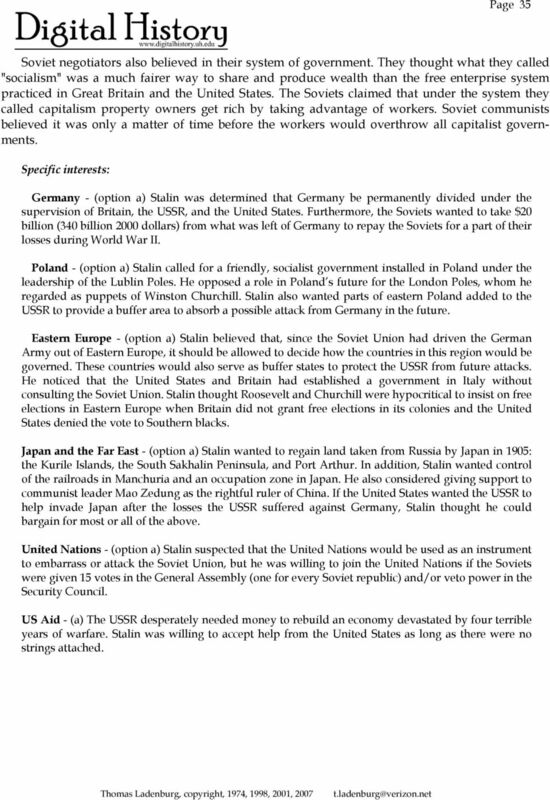 Read the following statements and decide which best characterizes the Yalta Agreement. USSR Appeased The real issue... is not what Stalin would or could have taken, but what he was given the right to take. This agreement provided Stalin with moral cloak for his aggressive designs in Asia, and, more important, with almost a legal title at the Peace Conference to the territories and privileges which he demanded. 10 Chester Wilmot 10 Chester Wilmot, The Struggle for Europe (New York: Harper and Row, 1959); quoted in Richard Fenno. Jr.. The Yalta Conference (Lexington, MA: D.C. Heath and Company, 1972), p. 76. 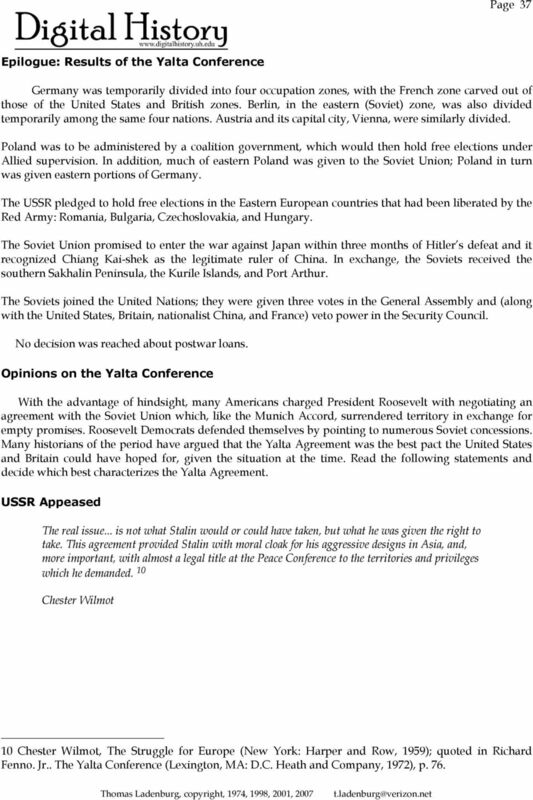 10 Page 38 Diplomatic Triumph The record... shows clearly that the Soviet Union made greater concessions at Yalta to the United States and Great Britain than were made by the allies. The agreements reached... were, on the whole, a diplomatic triumph for the United States and Britain. 11 Edward R. Stettinius, Jr. Nothing Conceded Aside from such things as the restoration of Russian sovereignty in Sakhalin or the Kuriles, the Western allies conceded nothing that Russia had not already taken or could not have taken. 12 Suggested Student Exercises: 1. Which of the above quotations do you think are best supported by the facts? In answering this question, consider at least 3 of the following: a. the position of the military forces of the major powers at the time of the conference b. the aims of each country c. the contributions of each to the war d. the legitimate interest of each side e. the results of the Conference 11Edward R. Stettinius, Roosevelt and the Russians (Garden City, NY: 1949), p. 295; quoted in Richard Fenno. op. cit. p. xiii. 12 Henry Steele Commager. Was Yalta a Calamity? A Debate, New York Times Magazine (August 3, 1952), p. 49; quoted in Richard Fenno, op. cit., p. xiii. International Relations. Simulation: The Treaty of Versailles This activity accompanies slide 15 of The Treaty of Versailles (part 1). Name: Simulation: The Treaty of Versailles This activity accompanies slide 15 of The Treaty of Versailles (part 1).ppt Instructions You are going to take part in a simulation of the Versailles negotiations. REARMAMENT 1935 The military terms of the Treaty of Versailles stated that: German army limited to 100,000 men Conscription not allowed. No submarines (No Unterseeboot/U-Boats). No aeroplanes. Only 6 battleships. Jesus paying the consequences of our sin. C. Why did World War II break out two decades after World War I? 1. Did World War I sow the seed for World War II? Archduke Franz Ferdinand. Siberian peasant who influenced Alexandra. Siberian peasant who influenced Alexandra. Grigori Rasputin. Causes of WWII 1. List three of the causes of World War II that we discussed in class. a. Lesson # Overview Title /Standards. Big Question for lesson (from teaching thesis) Specific lesson Objectives (transfer from above). Unit 9 - WWI Study Questions. 2. Who were the principle powers (Allies and Central Powers) during WWI? Date. Student Name. Prompt: This is a passage called World War I. It is about the history of World War I.